Oprah is the Most Dangerous Woman in the World! Why you ask? According to Oprah Winfrey's introduction page on the internet, the Oprah Winfrey Show is the highest rated talk show in television history, seen by 15-20 million viewers each day in the U.S., and in 132 other countries. Yet Oprah NEVER shares the Gospel of Jesus Christ with her fans. In fact, Oprah denied Jesus in front of millions of viewers. The Word of God plainly teaches that the ONLY Way to salvation is by Jesus Christ (John 14:6). Oprah denies this Truth. Oprah's show has been the number one talk show for 12 consecutive seasons. Since it's beginning in 1986 it has received 32 Emmy awards. In 1996, Oprah began Oprah's Book Club designed to get America reading again. Each of the books selected has become an instant bestseller averaging sales of over 1 million copies each. 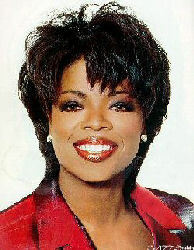 In 1997, Oprah was named Newsweek's "Most Important Person" in books and media, T.V. Guide's "Television Performer of the Year," the People's Choice Award for "Favorite Television Performer," and in 1996, Time Magazine recognized Oprah as one of America's "25 Most Influential People." This is why Oprah is so dangerous... she has massive influence over millions of people and is tragically using it to lead them straight into the fires of Hell. Tragically, America is obsessed with celebrity idol worship! If you don't believe it, do a web search under "idol" and watch the celebrities start popping up. Consider the show "American Idol." It is evil idolatry. Instead of people seeking the Truth for themselves, they foolishly rely upon New Agers like Oprah who teach and promote damnable heresies. Please understand that I don't condemn anyone, for the Bible condemns all of us as guilty, dirty, rotten, hell-deserving sinners. My salvation solely rests in Christ's righteousness, because of the precious blood that He gave for our sins. My intention is not to be unkind; but rather, to expose false teachings that lead people into the Lake of Fire. Oprah is extremely dangerous because she is leading millions of people (especially women) into the New Age movement and away from Jesus Christ. Oprah is a wolf in sheep's clothing (Matthew 7:15) who's leading multitudes into Hell. Unsaved people who would never listen to a preacher or the Bible ARE LISTENING to Oprah! She has power over millions of people, yet Oprah propagates a demonic message of spiritism and New Age doctrines. 1st Timothy 4:1 warns, "Now the Spirit speaketh expressly, that in the latter times some shall depart from the faith, giving heed to seducing spirits, and doctrines of devils." "New Age" is nothing new, it is simply a modern conglomerate of all sorts of pagan and Eastern religions. All straight from Hell. New Age is a religious movement that is centered in SELF — all you need is within — with no defined order of sin, repentance or salvation! You become your own god! The people worship the god of forces and promote The Aquarian Gospel of Jesus Christ. According to New Ageism, Jesus came to reveal this pantheistic nature of God and to teach humanity the gospel of Self-Realization. After illustrating the divine principle of “God within us all,” Jesus ascended to a place of distinction to live among the Masters of the Spiritual Hierarchy—Buddha and Krishna. Jesus promised that the essence of God would be revealed from time to time, and thus New Agers look for the imminent appearing of a World Teacher who will, as Jesus did, illustrate the divine human potential. In this way, New Age theology prepares the world for the coming of the False Prophet and the Antichrist. These are the false teachings of the New Age Movement. It's been in the news recently that Oprah Winfrey was moved when she heard invited guest, Faith Hill, singing the Gospel song "I Surrender All," during a practice rehearsal. The video shows an audience member moved to tears and Faith Hill emotionally moved by Oprah's story. Oprah tells how she desperately wanted a part in a 1985 Steven Spielberg movie, The Color Purple." Oprah says she went to a fat-farm to try to lose some extra pounds. While there, she said she couldn't bare the pressure anymore and just started praying, singing, and crying. She said she sang "I Surrender All," while giving up her obsession to be in the movie part. Sadly, Oprah never makes any mention of the name which is above every other name, the name of JESUS! "'I Surrender All' is one of my favorite songs. … And it lives in my spirit because I try to surrender everything—I surrender my life, I surrender my doings, I surrender my experiences—because I know that God can dream a bigger dream than we can dream for ourselves." "I'd like to turn down the lights. If you're not comfortable with the word God, it doesn't matter. Please know that on this day, you can begin to move forward in your life in a grander, bolder direction. The universe is waiting, willing, joyfully, gloriously, to support you. Slowly open your eyes. And know this: I am so grateful for you. Thank you"
Blasphemy! Whoa! Oprah is way out in left field doctrinally! Oprah needs to find the Word of God desperately. 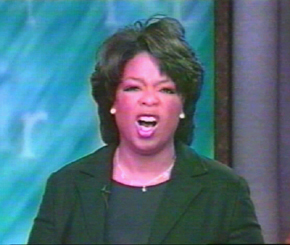 The only thing that Oprah has surrendered to is demonic heresy! First of all Oprah, if you're not comfortable with the word "God"... TOUGH! God is God and you can't recreate Him in your own twisted concepts. Jesus Christ is God (Isaiah 9:6; John 1:1-3,14;10:33; 1st Timothy 3:16; Revelation 1:8 (All Scriptures from the preserved King James Bible). Secondly, Oprah says "All that is divine, my heart is open to you..." This is the vague, wishy-washy terms of the New Age crowd. Only God is Divine Oprah! If you want to speak to Divinity, then you must pray to the Godhead: God the Father, God the Son, and God the Holy Spirit. There is NO other Divine being. Oprah is praying to demonic spirits. Oprah says, "The universe is not interested in your struggles and your pain and your sorrow..." "The universe" Oprah? The Word of God teaches that God is very much interested in our struggles and pain and sorrow. 1st Peter 5:7 reads, "Casting all your care upon him; for he careth for you." Psalm 57:1 reads, "Be merciful unto me, O God, be merciful unto me: for my soul trusteth in thee: yea, in the shadow of thy wings will I make my refuge, until these calamities be overpast." The Bible teaches that when we are struggling or down that we are to go to the Lord Jesus Christ for refuge... under the shadow of the Almighty (Psalm 91:1). Oprah never mentions the Bible in any of her teachings. The reason is obvious, she is an unsaved heretic. Oprah says, "My heart is open to find the flow, the flow, the flow, the flow that is my life." This is Devilish doctrine. New Age doctrines/practices (such as Kundalini Yoga) teach that there are seven "Chakras" (or spiritual doorways) within the body through which energy flows. They teach that each planet has a presiding god (demon) over it. They believe that these channels of energy can be tapped into through meditation, yoga, acupuncture, etc. Holistic medicine is also based upon this concept known as Yin and Yang. When Oprah speaks of the "flow," she is talking about demonic sources of spiritual energy, NOT the Holy Spirit of God. The Holy Spirit of God ALWAYS works through the Word of God. John 1:1-3 declares that Jesus Christ is the Living Word of God. Also see Revelation 19:13 where Jesus' name is called the "Word of God." You CANNOT separate Jesus Christ from the Spirit of God, for He is the Spirit of God. Romans 8:9 reads, "But ye are not in the flesh, but in the Spirit, if so be that the Spirit of God dwell in you. Now if any man have not the Spirit of Christ, he is none of his." Oprah does NOT have God's Spirit, but a demonic spirit. We are clearly taught in 1st John 4:1 to "try" (or test) the spirits to see if they are of God or not, "Beloved, believe not every spirit, but try the spirits whether they are of God: because many false prophets are gone out into the world." The ONLY true test is the Word of God. John 17:17 tells us that the Word of God is Truth! Ephesians 6:17 tells us that the Word of God is our sword with which to fight darkness, "And take the helmet of salvation, and the sword of the Spirit, which is the word of God." Oprah FAILS all tests when her teachings are tested to the Eternal, Inspired, Infallible, Preserved Word of God. Oprah says, "How can I be used to serve the greater calling that is my life? That is the question. I surrender to that." 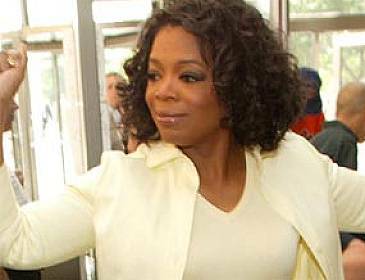 Oprah TELLS ON HERSELF here by saying that she was only surrendering to "THE GREATER CALLING THAT IS MY LIFE." Since when is one's personal life the "greater calling." Again, let's test Oprah teachings to the Word of God. Revelation 4:11 proclaims, "Thou art worthy, O Lord, to receive glory and honour and power: for thou hast created all things, and for thy pleasure they are and were created." God created mankind to please Him...period! Hebrews 11:6 teaches that it is IMPOSSIBLE to please God without faith. Faith is our obedience and trust upon Jesus Christ, the Living Word... and the Bible, God's Written Word. There is NO other way to please God. Oprah's words sound very selfish and self-centered, which is exactly what New Age is all about. Listen friend, Oprah is going to burn in Hell if she doesn't repent and turn to Jesus Christ in faith. I ask you to come to Jesus as your Saviour, trusting upon the Precious blood which He shed for your sins upon the cross. Come to Jesus now as a sinner, and ask Him to forgive you of your sins, believing upon Him as your ONLY way to heaven (Acts 16:31; Romans 10:13). "NEW YORK — On her television program, in her magazine and on tour, she moves audiences to tears with stories of spirituality, strength and the liberating power she's found within. Scores of fans — mostly women — follow her across the country, live by her words and practically worship her. They listen to the self-help gurus she interviews, read the books she suggests and stick to the diets she swears by. They even want her to run for president someday. "Dear Oprah, I believe in your spirit. You are truly a wonderful woman who has made me laugh, made me cry, made me open my eyes to many things," writes fan Lissa Pitcock on the "Gifts From the Heart" Oprah tribute Web site. "You have saved my life without ever knowing it. ... You are my hero, to be sure!" There's no doubt Winfrey has become a powerful influence in her fans' lives. But has the sensation evolved into the Cult of Oprah? Some cult experts say that's not such a stretch. "The definition of 'cult' as 'harmful group' doesn't apply to Oprah," said Joe Szimhart, a cult-information specialist and former exit counsellor. "But certainly 'cult' as 'devotional activity surrounding a charismatic person' does." Winfrey was mentioned at a recent national cult conference in Connecticut, according to Philadelphia-area expert David Clark. A former Bible-based cult member who later worked as an exit counsellor, Clark said attendees recommended Winfrey get cult-awareness training so she would be attuned to how people can be brainwashed. "My main concern is Oprah's long history with New Age people," Clark said. Clark remembers Winfrey criticizing brainwashing early in her TV career. Since then, he said, she's been associated with New Age spirituality gurus whose messages and tactics have some cult-like qualities. One thing is clear, Oprah needs Jesus Christ desperately. I did NOT write this article to be unkind at all, nor to attack Oprah. I simply wrote this article to WARN everyone that Oprah is a false prophet, a wolf in sheep's clothing. "In flaming fire taking vengeance on them that know not God, and that obey not the gospel of our Lord Jesus Christ"